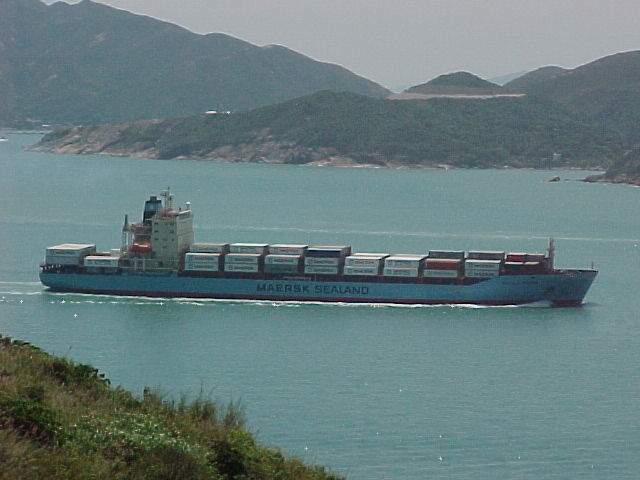 The "Nicolai Maersk" seen off the coast of New Zealand. My cabin on C-deck. 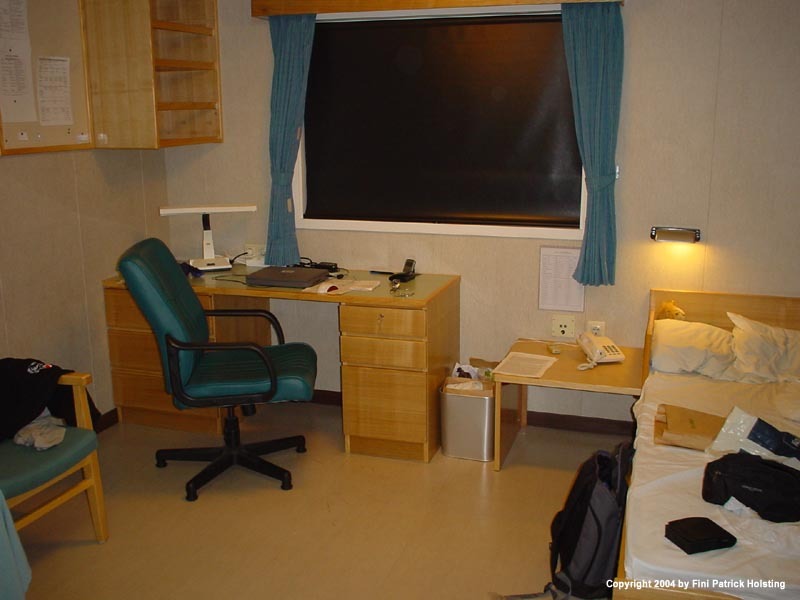 Quite spacious, if not as cozy as the cabin I had on "Olga Maersk". The arrangement on C-deck outside the accomodation. The aft side of the accomodation, with the stores crain visible just in front of the engine room hatch. The towering structure in the back ground is the railings for the stores crain, a so called mono rail crain. 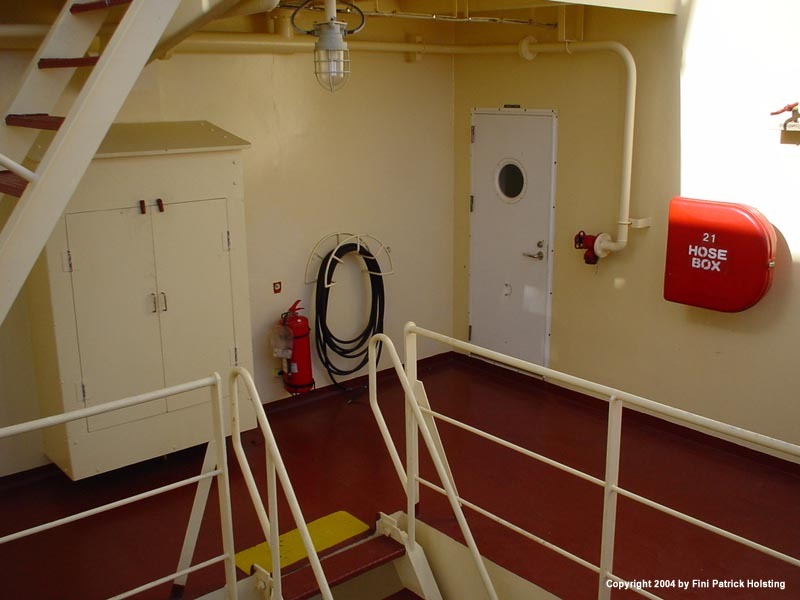 Looking up the accomodation, we see the large air intakes for the engine room. The sun screen beside the funnel covers the sun deck. 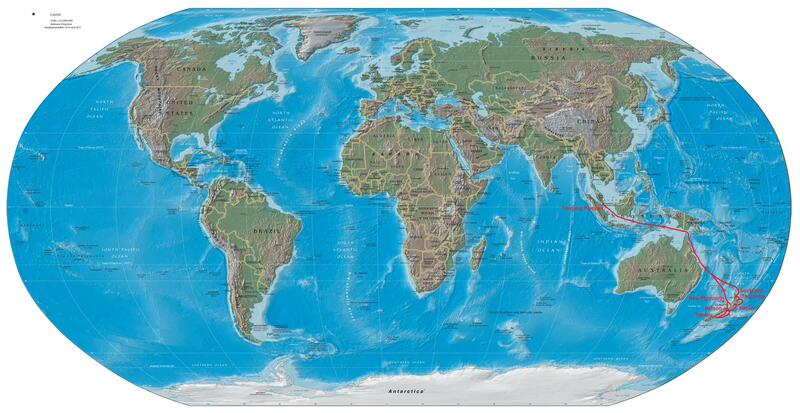 Encountering one of the wonders of this world on our way from Malaysia to New Zealand. The first sight of New Zealand. 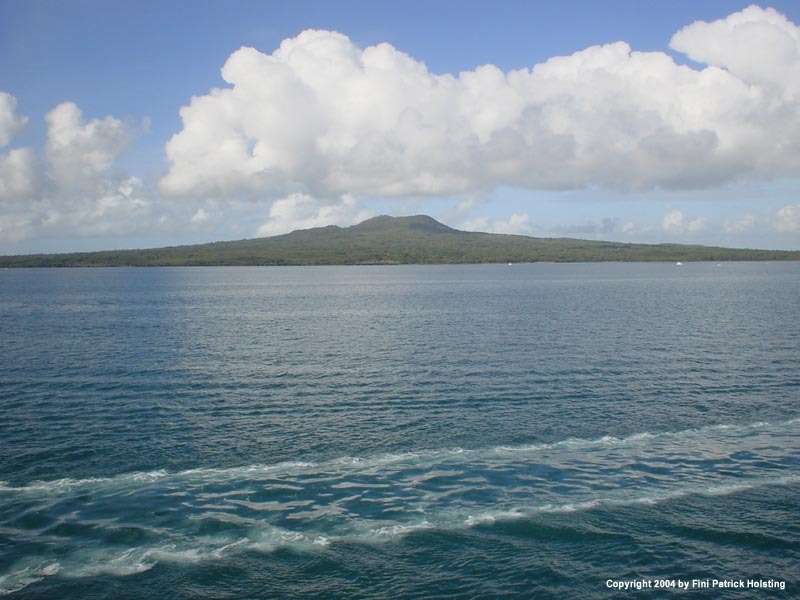 Here we're cruising at slow speed outside Auckland, waiting for the pilot. 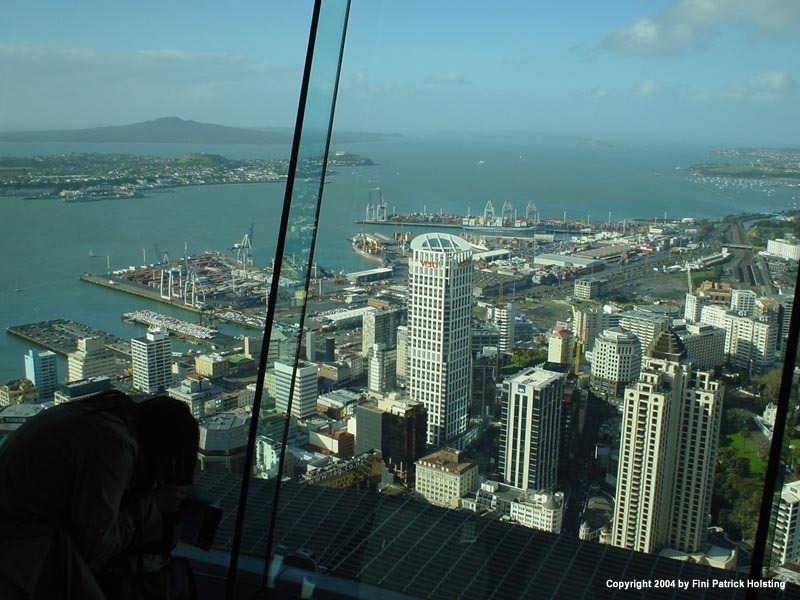 Auckland is New Zealand's biggest city with around 1 million citizens. Picking up speed and heading for the port after picking up the pilot. 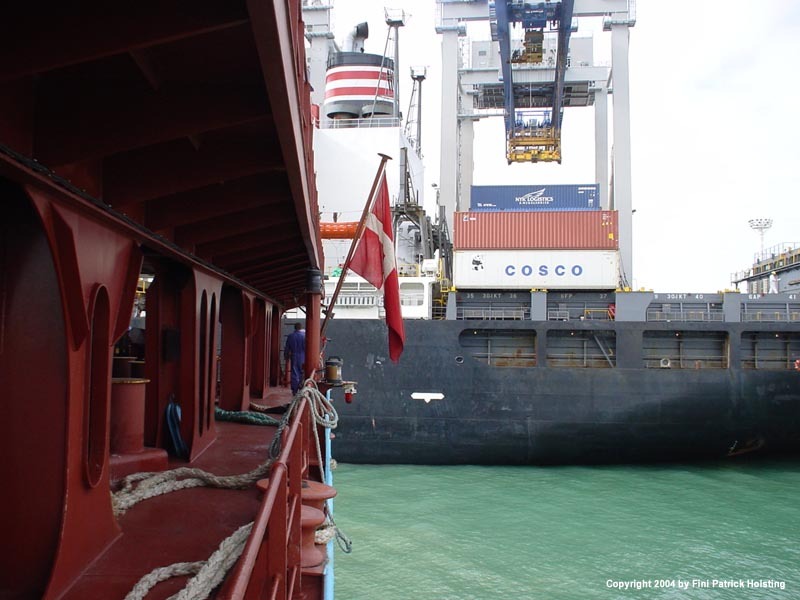 In the top of the picture the life boat can be seen, and in front of the containers is the man-over-board rescue boat. 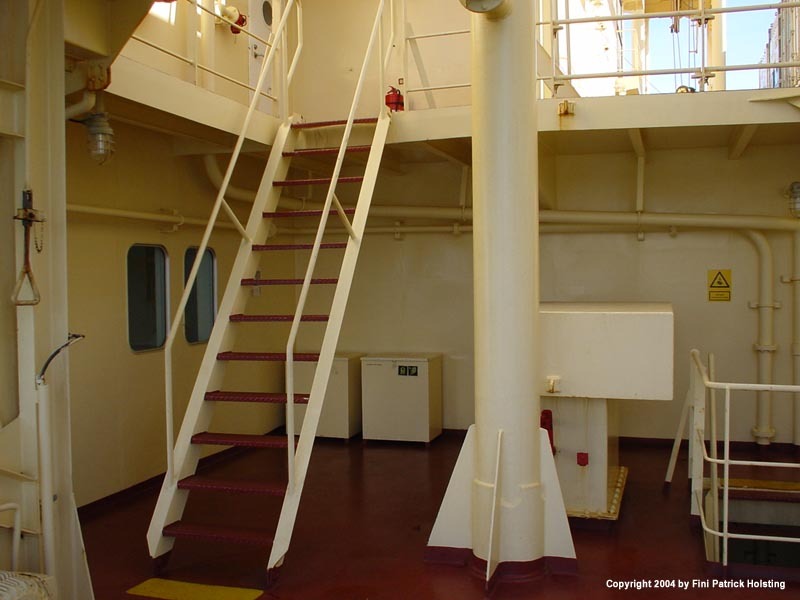 Arrangement on the boat deck port side (B-deck). Inside the windows is the Officer's Dining Saloon. A 35-person life boat. The small 4-stroke diesel engine gives it a speed of 6 knots, and there is sufficient fuel for at least 24 hours continious operation. Enough to travel 150 miles. The boat contains food and water rations, and has a bunch of life saving equipment. 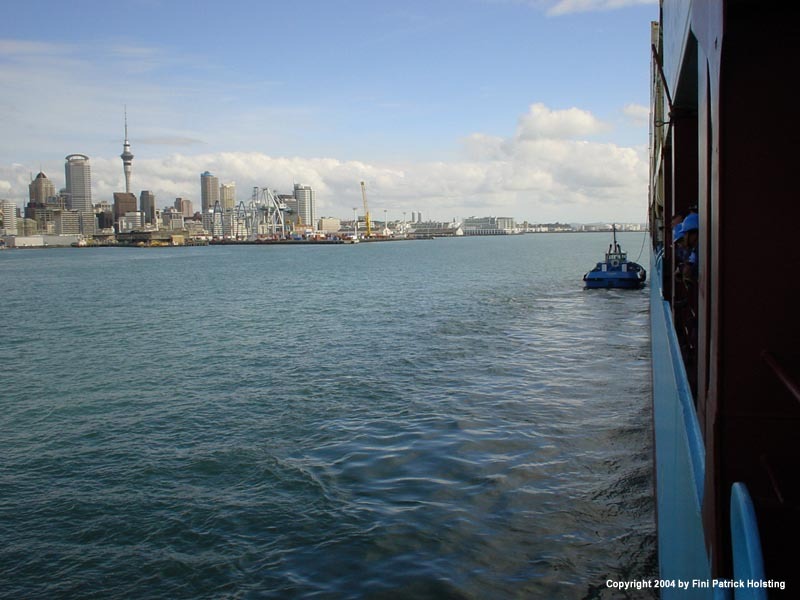 Weather deck starboard side, seen as we approach Auckland. 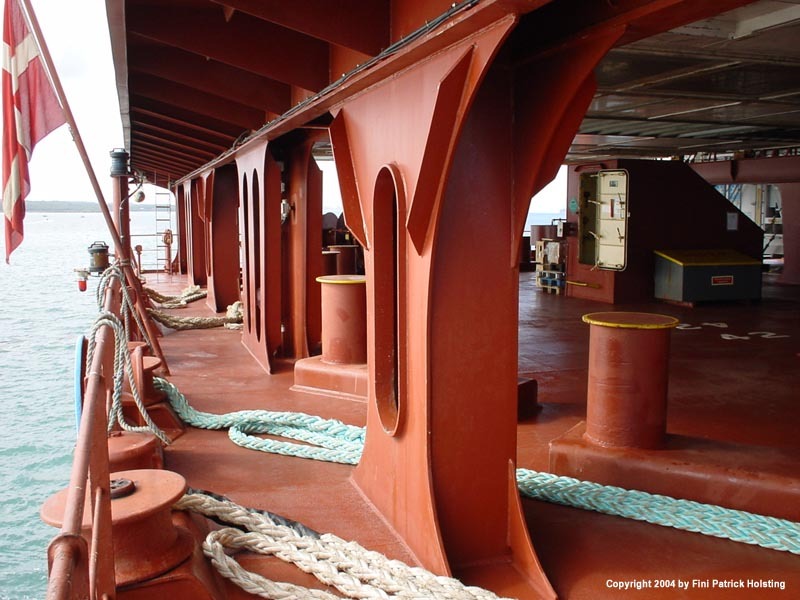 The grey rods in the bottom left are lashing rods for securing the containers. 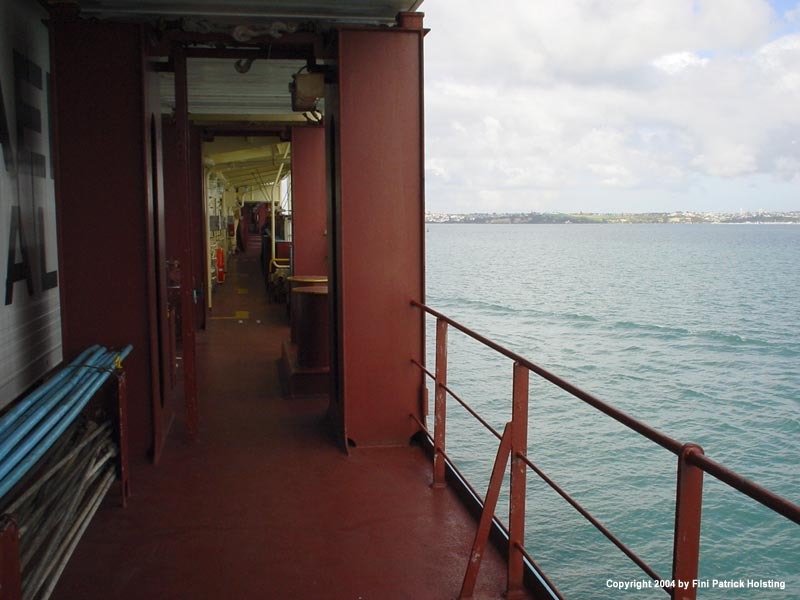 The aft deck or poop deck made ready for mooring operations when arriving at Auckland. 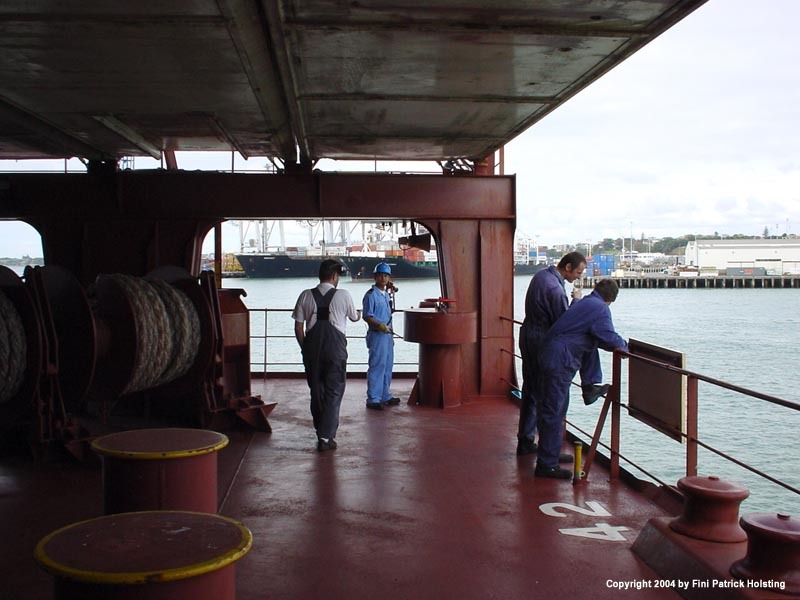 Some of the crew assembling in port side to have a look at Auckland. 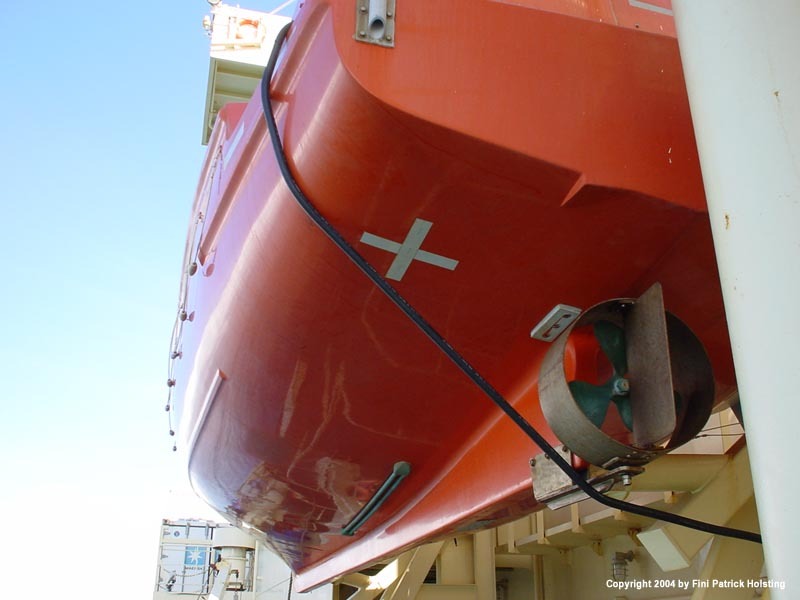 The 5 winches on the poop deck are electrically driven. The open door leads to the steering gear. 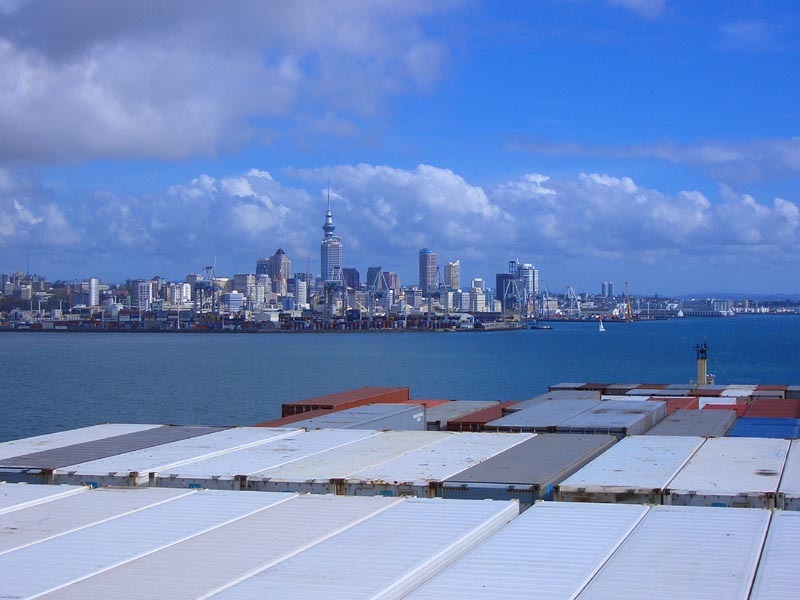 A look at Auckland from the bridge as we approach. 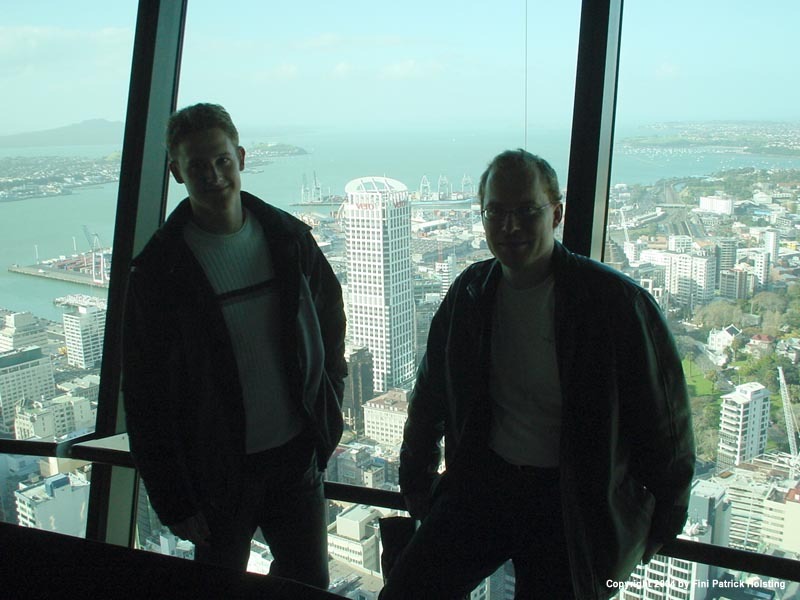 1st Engineer Morten having a look at Auckland. It was a warm sunday late morning, and a beautiful sight from the sea side. A tug boat is made fast forward to guide us to the pier. 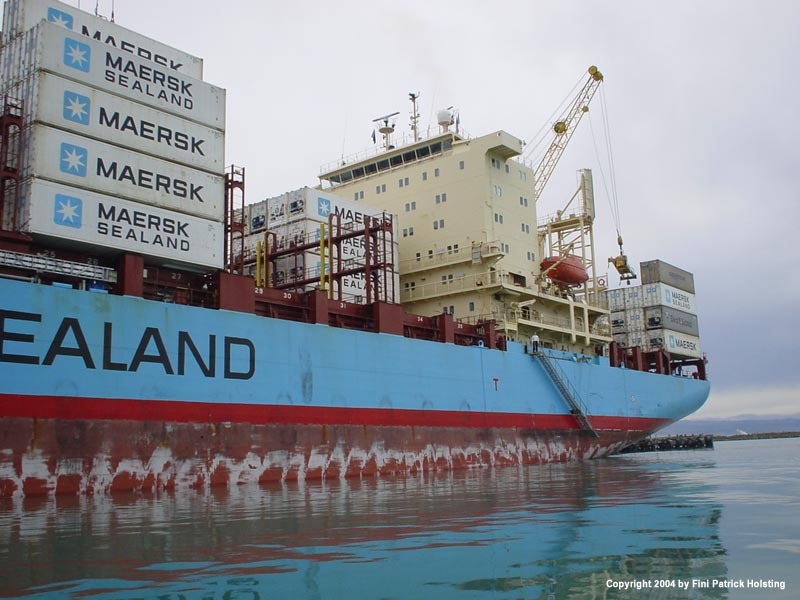 Nicolai Maersk and its sister ships are amongst the largest ships calling Auckland. The ship was backed into the bassin where we were supposed to lay. But first we had to wait for another ship to leave. 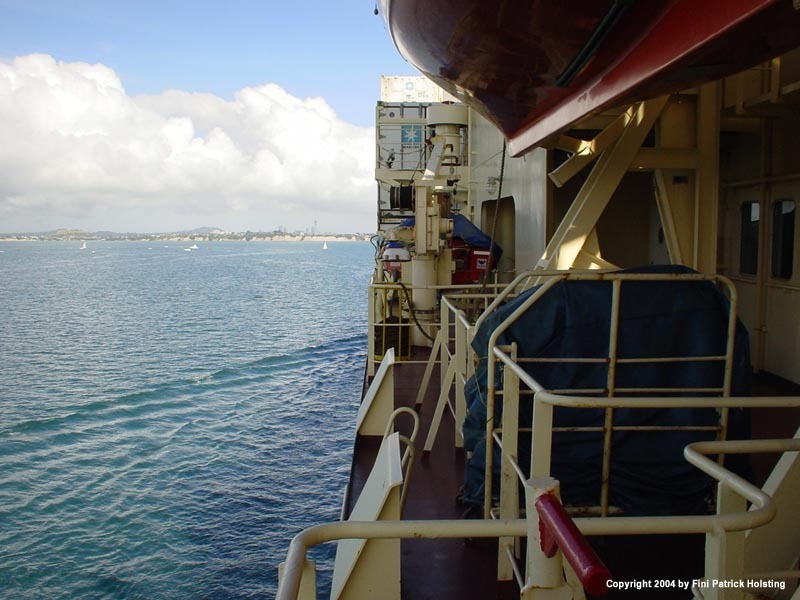 Moving slowly backwards past a Japanese container vessel, which we moored behind. 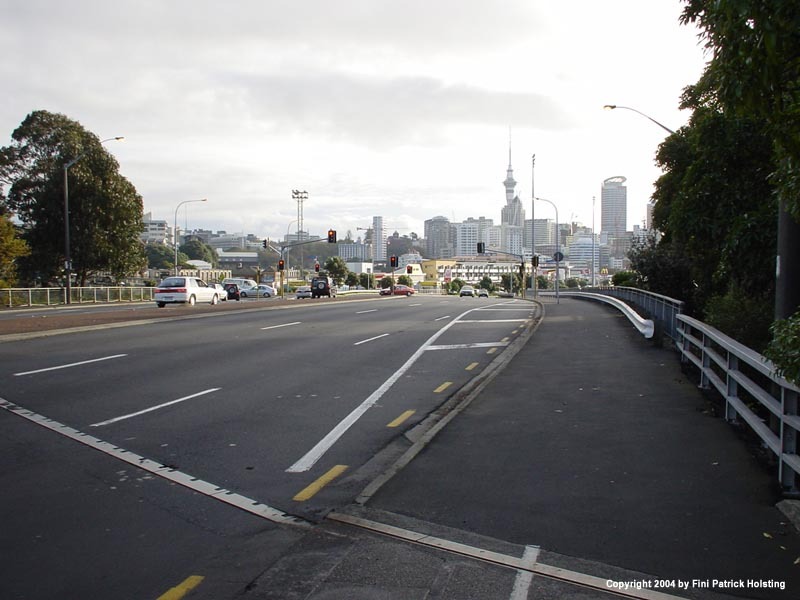 On shoreleave in Auckland, walking towards the city. The port is just to the right. 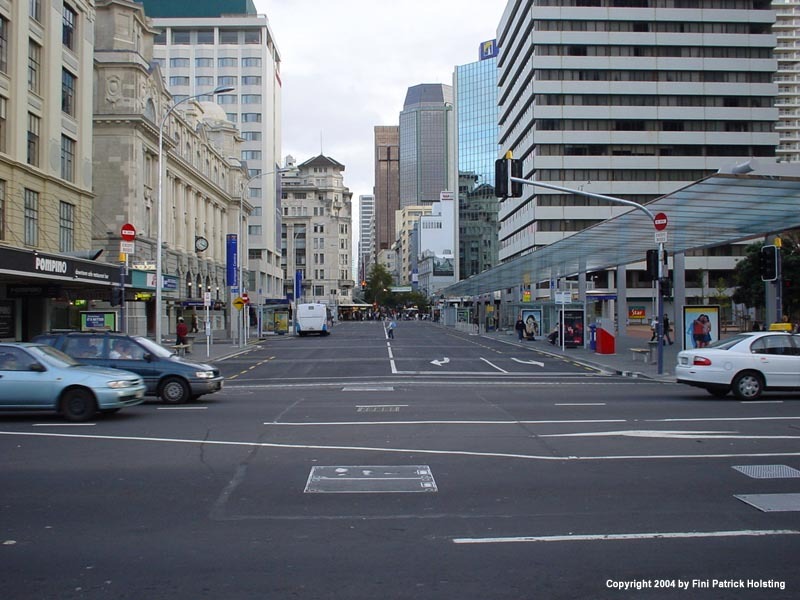 Down town Auckland. This street leads to the main street, which we found humming with life. 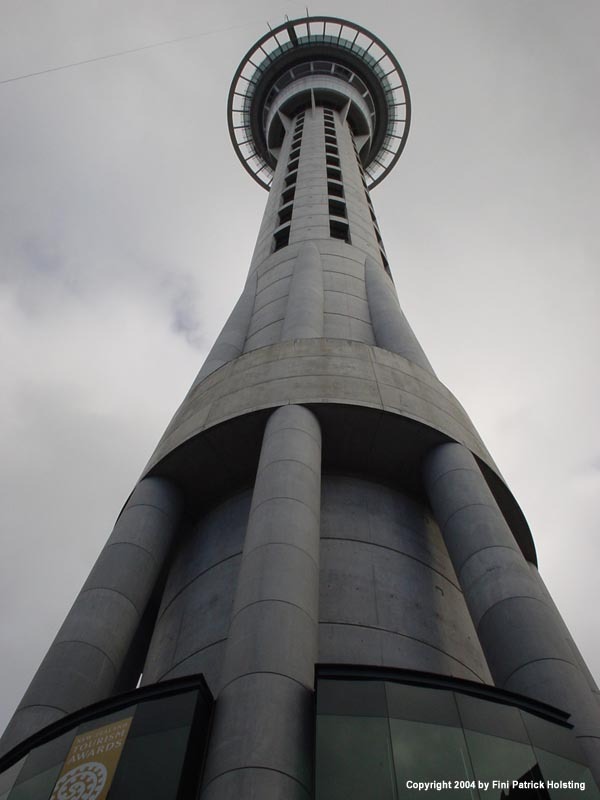 The Sky Tower, the tallest building in the southern hemisphere. 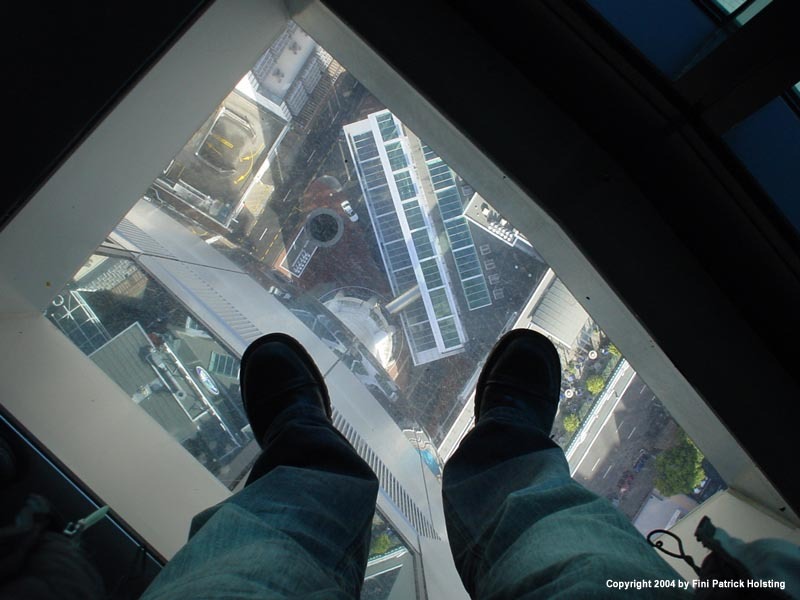 On a later visit to Auckland I took a trip to the observations decks over 200 meters above ground level. Chief officer Brian and me on the observation deck. 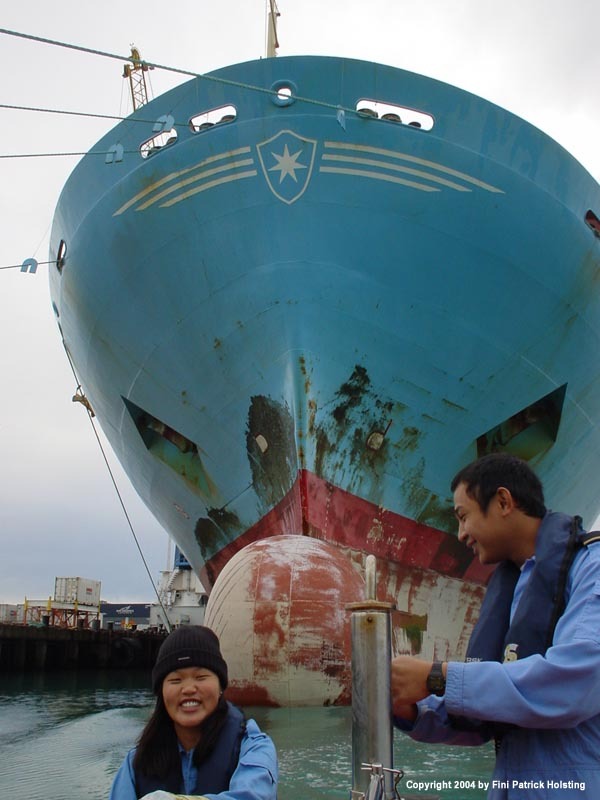 The port and Nicolai Maersk can be seen in the back ground just left of Brian's head. 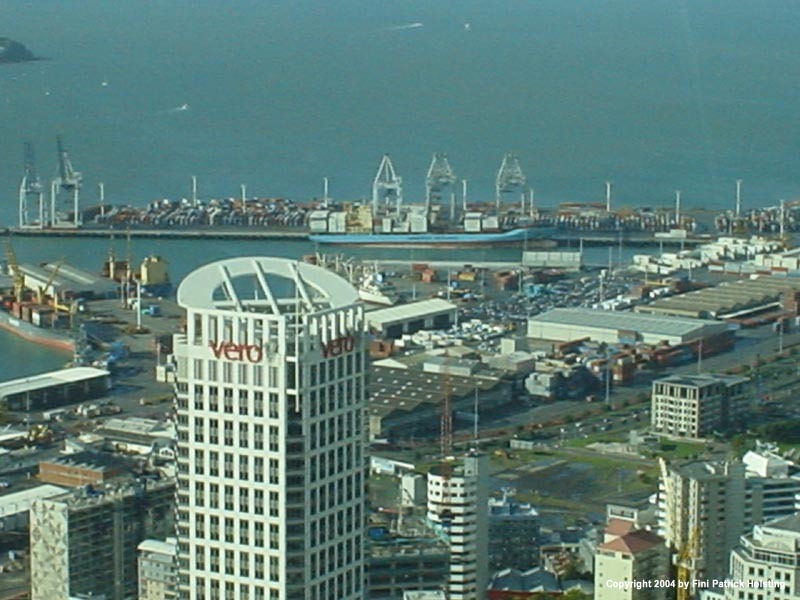 A zoomed picture clearly shows the ship. 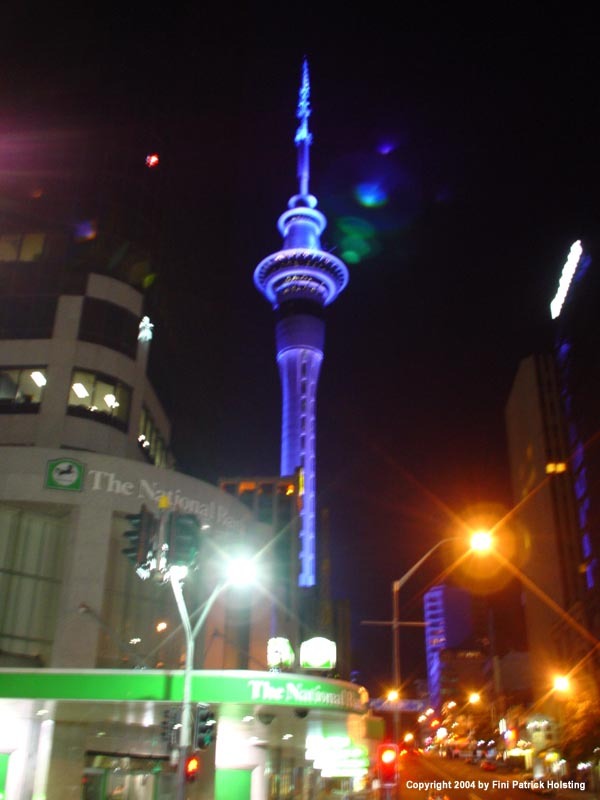 The exterior of Sky Tower is beautifully illuminated during night time. 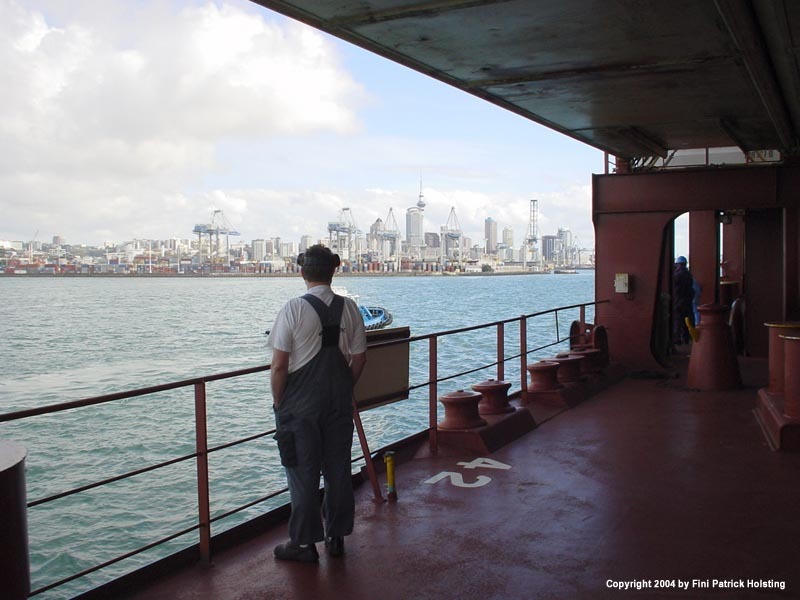 After leaving Auckland, we stopped shortly at the port of Tauranga, and after that we went to Napier where this pictures was taken. Here we had time to do rutine testing of the MOB-boat (Man Over Board resque boat). 3rd engineer Danilo is ready to lower the resque boat. 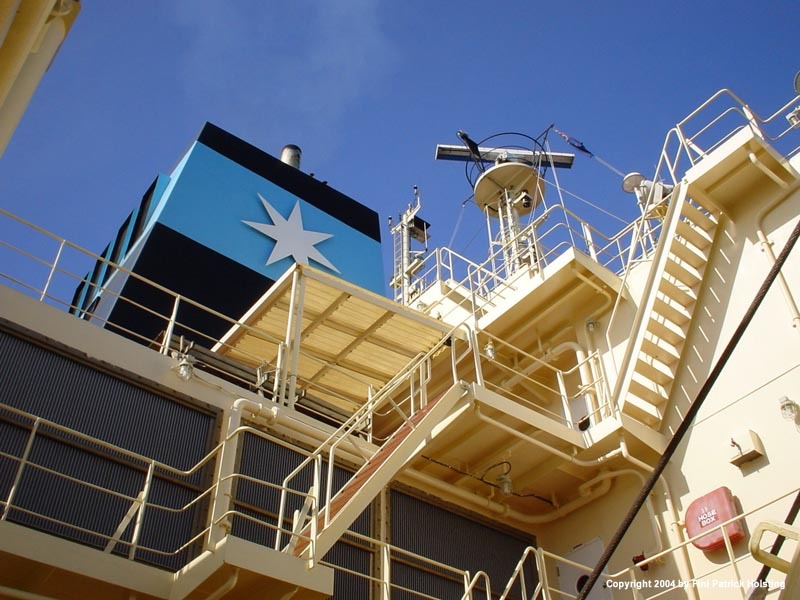 I went along in the resque boat, and had a great chance for getting a few pictures of Nicolai Maersk. Chief Officer Brian is watching from the top of the gangway. 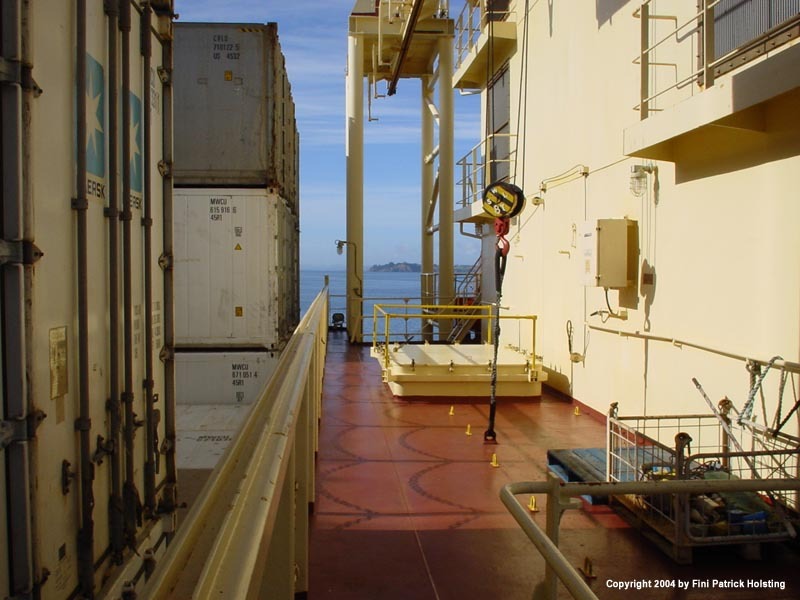 In the background, a shore crain is loading a container on the aft deck. Fellow cadet Katrine is steering the boat and 3rd officer Dunmille is telling a joke. 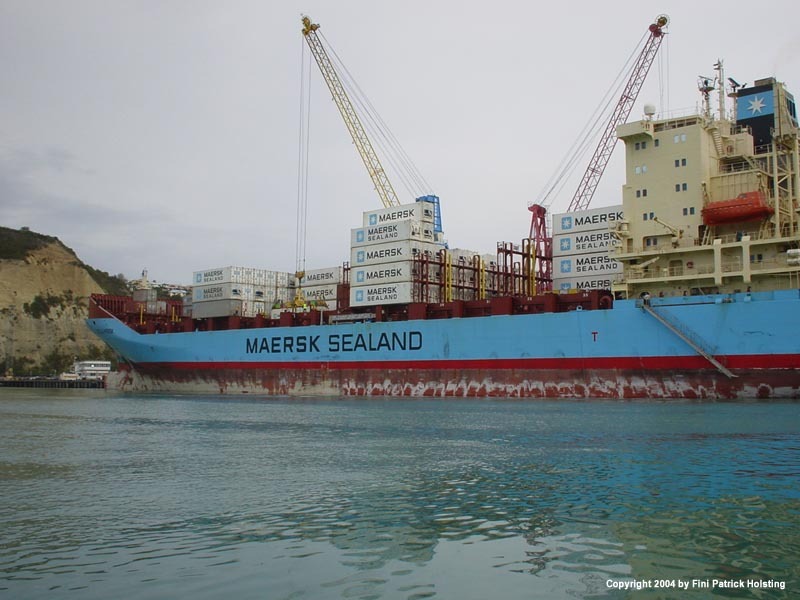 At nearly 199 meters, the Nicolai Maersk is one of the smaller Maersk Sealand vessels. 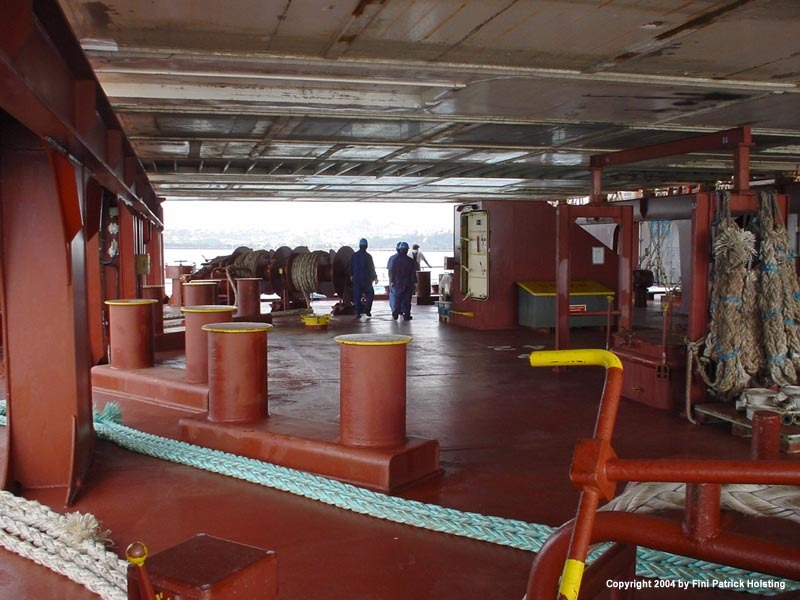 Cargo operations in progress on the aft deck. 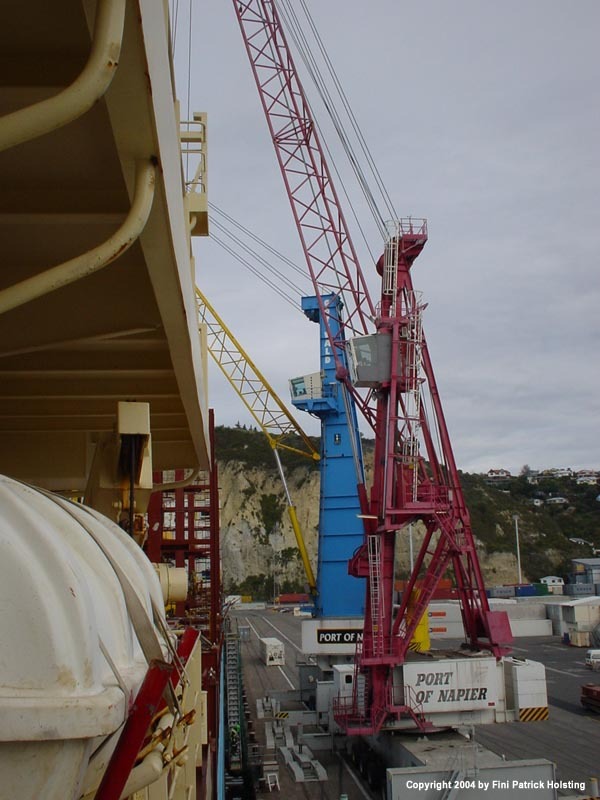 In Napier they didn't use gantry cranes but instead used these mobile cranes. The crane drivers were quite skilled! 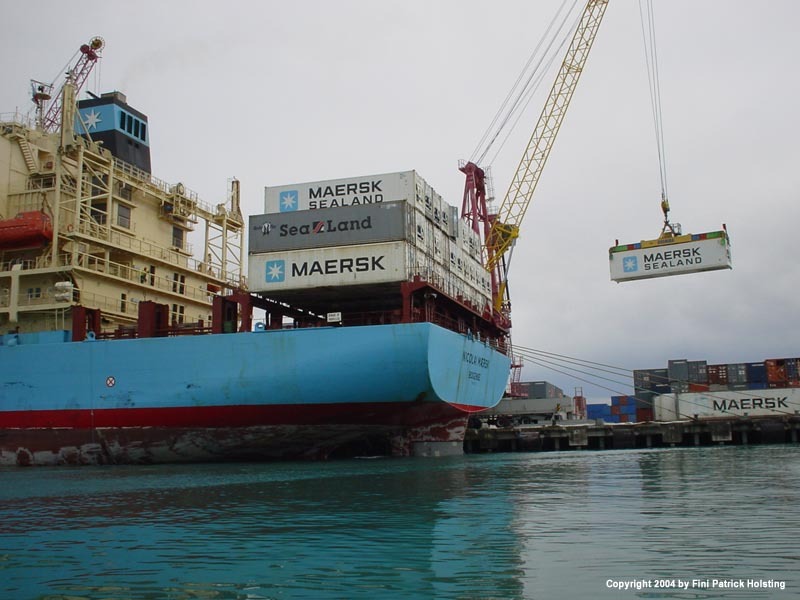 Two cranes handle the cargo operations in front of the accommodation. 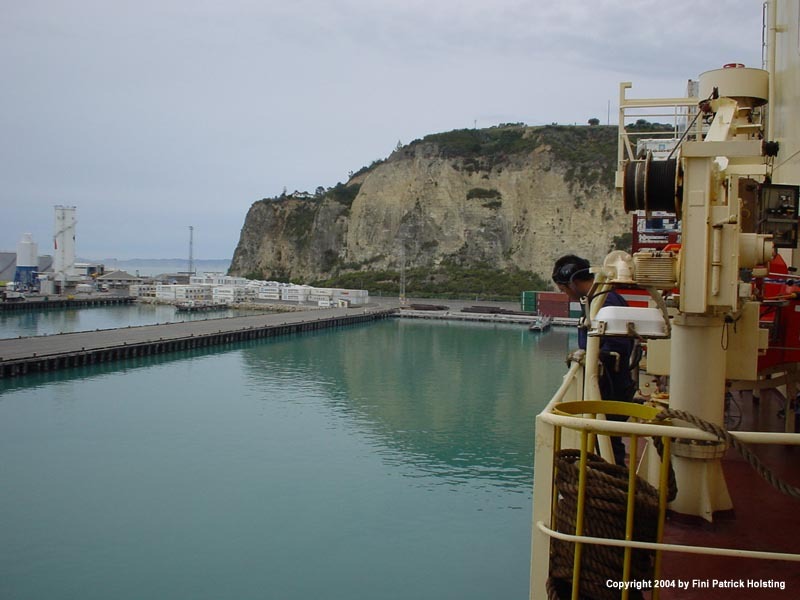 Safely moored in the port of Napier. The peeling bottom paint is actually deliberate. 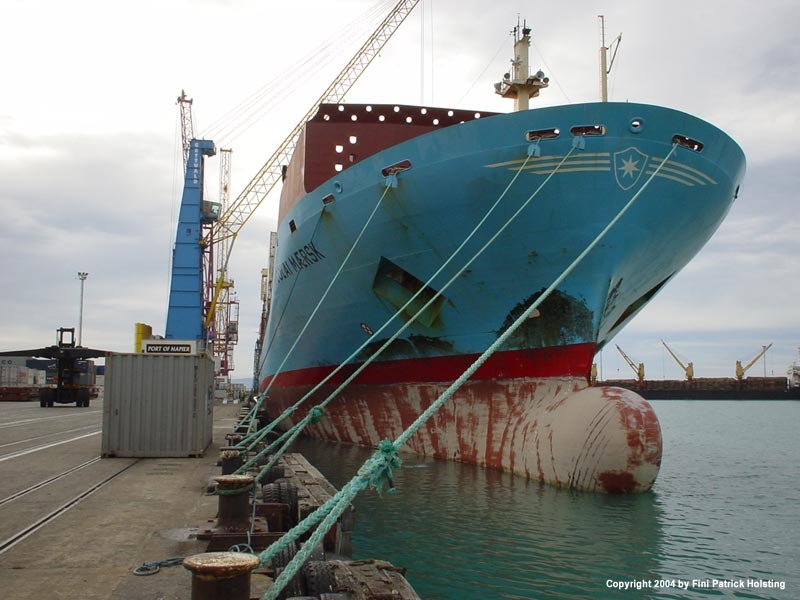 Buy allowing the paint to gradually peel off, marine growth is prohibited since it falls off with the paint. 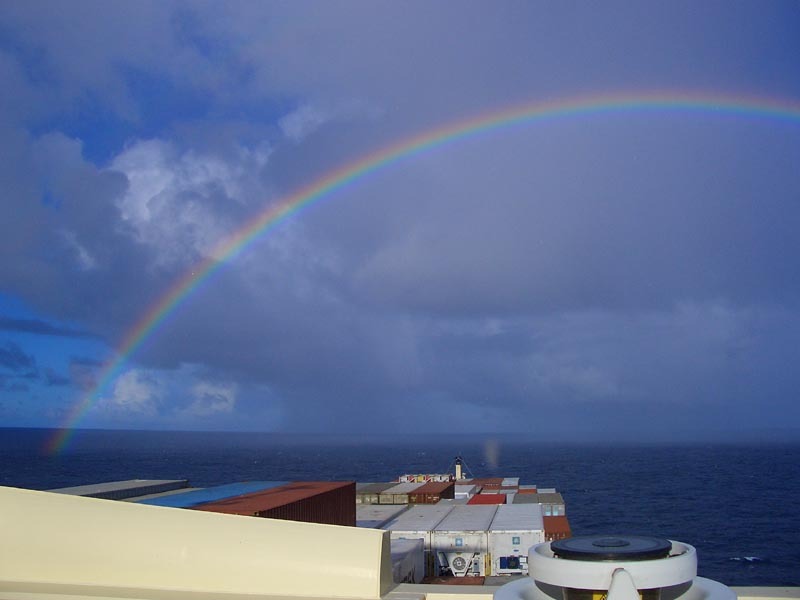 Marine growth on the hull is undesired, since it increases resistance and fuel consumption.